WASHINGTON (CNS) — Fifty years after the assassination of the Rev. 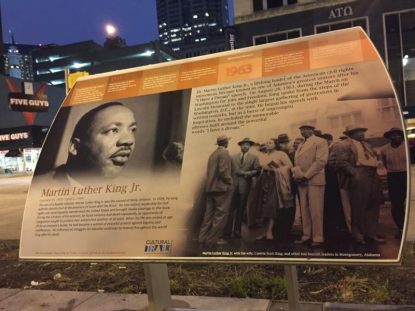 Martin Luther King Jr. — he was gunned down April 4, 1968 — the great civil rights advocate continues to be an outstanding example of how to live the Gospel message, according to Catholic clergy and others. “This tragic loss (of Rev. King) did not still his voice — it continues to ring out and inspire new generations in confronting the challenges of prejudice, injustice and division today,” Cardinal Donald W. Wuerl of Washington wrote in an April 4 blog. 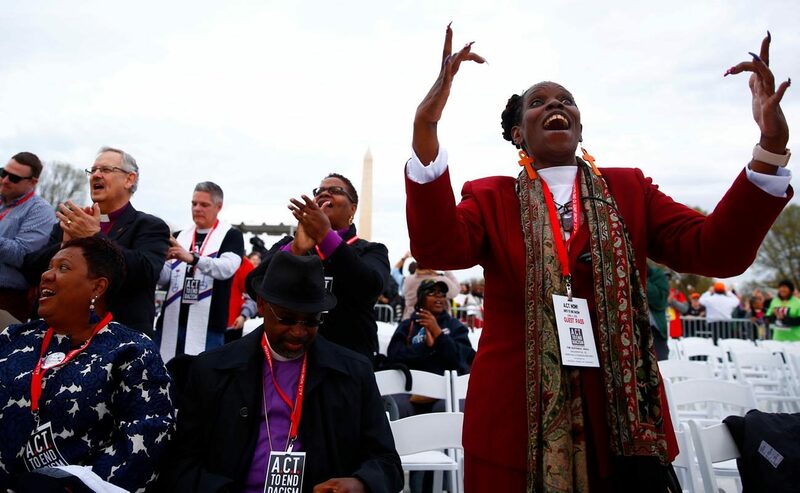 Various faith leaders, including Washington Auxiliary Bishop Roy E. Campbell, spoke at a rally on the Mall that followed the prayer service at the memorial. 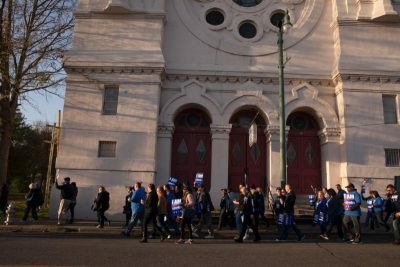 The Archdiocese of Washington sponsored a “Catholics Against Racism” banner at the rally with local Catholics marching behind it. Some participants carried small signs with the same message. Since the news of his murder, “rippled across the country,” bells at the National Civil Rights Museum in Memphis and the King Center in Atlanta will toll at 6:01 p.m. (CDT) — the approximate time Rev. King was killed; in the city of Memphis at 6:05 p.m. (CDT); and at 6:05 p.m. (CDT) nationally. In Baltimore, Archbishop William E. Lori and several Baltimore-area faith community leaders have planned a special interfaith and ecumenical prayer service in honor of Rev. King April 12 at the Cathedral of Mary Our Queen in Baltimore. The Rev. Rafael G. Warnock, pastor of Ebenezer Baptist Church in Atlanta, will be guest preacher. Rev. King was pastor of Ebenezer Baptist for several years before his assassination. Earlier this year, Archbishop Lori issued a pastoral reflection on the enduring power of Rev. King’s principles of nonviolence. In Texas, Archbishop Gustavo Garcia-Siller of San Antonio and Vincentian Father Kevin Fausz, pastor of Holy Redeemer Church, were scheduled to help lead an evening service of remembrance, beginning with a candlelight walk from St. Gerard Catholic High School to Holy Redeemer. Along the way participants planned to sing civil rights songs, led by a bus in which civil rights heroine Rosa Parks rode. At the church, the service was to include readings by different individuals of six brief prayers from the words Rev. King prayed at various events. Back in Washington, Msgr. Raymond East, pastor of St. Teresa of Avila Parish, recalled how the nation’s capital was among cities across the country that saw rioting, the burning of buildings and other violence as people reacted to the news of Rev. King’s death. Such events “are remembrances that are really fresh” for some of his parishioners, he told the Catholic Standard. “Fifty years later, what has become clear is the vision Dr. King had of the ‘beloved community’ as a place, a condition of the world in which we reflect what we pray in the Lord’s Prayer — ‘thy kingdom come on earth as it is in heaven,'” Msgr. East said. The Baptist preacher used “beloved community” in his speeches to denote a society in which racism and discrimination is ended by nonviolent means and reconciliation. Both Bishop Campbell and Msgr. East noted that Rev. King lived a life that showed he was a follower of Jesus Christ. “He (Rev. King) tried to live like Christ, being non-violent and seeing God in all people,” Bishop Campbell said.